399 pages ; 25 cm. "With the scope of Dune and the commercial action of Independence Day, this near-future trilogy is the first chance for English-speaking readers to experience this multiple-award-winning phenomenon from China's most beloved science fiction author. Set against the backdrop of China's Cultural Revolution, a secret military project sends signals into space to establish contact with aliens. An alien civilization on the brink of destruction captures the signal and plans to invade Earth. Meanwhile, on Earth, different camps start forming, planning to either welcome the superior beings and help them take over a world seen as corrupt, or to fight against the invasion. The result is a science fiction masterpiece of enormous scope and vision"-- Provided by publisher. Chinese fiction -- Translations into English. 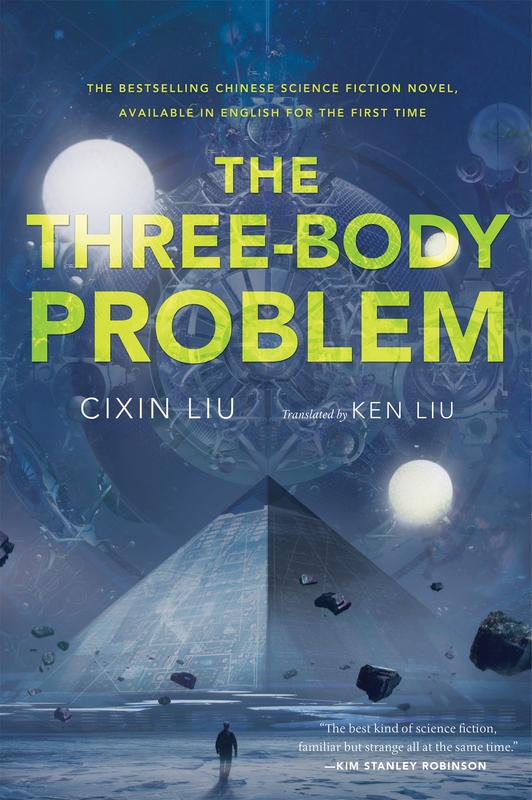 Experience Cixin Liu's award-winning and bestselling masterpiece, The Three Body Problem. A secret military group sends signals into space in hopes of establishing contact with aliens--and succeeds. Picking up their signal is an alien civilization on the brink of destruction who now readies to invade Earth. News of the coming invasion divides humanity like never before. Some want to help the superior beings take over a world they see as corrupt. Others prepare to fight the invasion at all cost. The Three Body Problem begins a ground-breaking saga of enormous scope and vision.
" The War of the Worlds for the twenty-first century . . . Packed with a sense of wonder." Cixin Liu is the author of The Three Body Problem, which won Best Novel at the Hugo Awards 2015. Fans of hard SF will revel in this intricate and imaginative novel by one of China's most celebrated genre writers. In 1967, physics professor Ye Zhetai is killed after he refuses to denounce the theory of relativity. His daughter, Ye Wenjie, witnesses his gruesome death. Shortly after, she's falsely charged with sedition for promoting the works of environmentalist Rachel Carson, and told she can avoid punishment by working at a defense research facility involved with the search for extraterrestrial intelligence. More than 40 years later, Ye's work becomes linked to a string of physicist suicides and a complex role-playing game involving the classic physics problem of the title. Liu impressively succeeds in integrating complex topics-such as the field of frontier science, which attempts to define the limits of science's ability to know nature-without slowing down the action or sacrificing characterization. His smooth handling of the disparate plot elements cleverly sets up the second volume of the trilogy. (Nov.) © Copyright PWxyz, LLC. All rights reserved. Strange and fascinating alien-contact yarn, the first of a trilogy from China's most celebrated science-fiction author.In 1967, at the height of the Cultural Revolution, young physicist Ye Wenjie helplessly watches as fanatical Red Guards beat her father to death. She ends up in a remote re-education (i.e. forced labor) camp not far from an imposing, top secret military installation called Red Coast Base. Eventually, Ye comes to work at Red Coast as a lowly technician, but what really goes on there? Weapons research, certainly, but is it also listening for signals from spacemaybe even signaling in return? Another thread picks up the story 40 years later, when nanomaterials researcher Wang Miao and thuggish but perceptive policeman Shi Qiang, summoned by a top-secret international (!) military commission, learn of a war so secret and mysterious that the military officers will give no details. Of more immediate concern is a series of inexplicable deaths, all prominent scientists, including the suicide of Yang Dong, the physicist daughter of Ye Wenjie; the scientists were involved with the shadowy group Frontiers of Science. Wang agrees to join the group and investigate and soon must confront events that seem to defy the laws of physics. He also logs on to a highly sophisticated virtual reality game called "Three Body," set on a planet whose unpredictable and often deadly environment alternates between Stable times and Chaotic times. And he meets Ye Wenjie, rehabilitated and now a retired professor. Ye begins to tell Wang what happened more than 40 years ago. Jaw-dropping revelations build to a stunning conclusion. In concept and development, it resembles top-notch Arthur C. Clarke or Larry Niven but with a perspectiveplots, mysteries, conspiracies, murders, revelations and allembedded in a culture and politic dramatically unfamiliar to most readers in the West, conveniently illuminated with footnotes courtesy of translator Liu. Remarkable, revelatory and not to be missed. Copyright Kirkus Reviews, used with permission. During China's cultural revolution of the 1960s, a woman who is a political undesirable finds purpose at a secret military base that is sending signals into space to communicate with an alien culture. Years later, a video game called Three Body may hold the key to what those aliens want from Earth, and a physicist gets pulled into a worldwide effort to prepare for their arrival. VERDICT This 2006 Chinese best seller finally gets an English translation from Nebula and Hugo Award winner and author Ken Liu. Along with the unusual setting, the novel includes a lot of discussions of high-level physics (sometimes helpfully couched within the video game), as the aliens come from a world with three suns and the unpredictable motions of the trisolaran system threaten their continued existence. It's not an easy sell to Western readers, but the translator provides helpful footnotes explaining the unfamiliar historical and cultural references. Fans of hard sf likened to the work of Arthur C. Clarke will look forward to the rest of the series. [See Eric Norton's sf/fantasy feature, "A Multiplicity of Realms," LJ 8/14.] (c) Copyright 2014. Library Journals LLC, a wholly owned subsidiary of Media Source, Inc. No redistribution permitted.